Bastian talks about possible expansion of flights to Latin America, innovations to speed up security lines. Francisco Kjolseth | The Salt Lake Tribune New Delta Air Lines CEO Ed Bastian talks about the future of Delta and its operations in Salt Lake City during an interview on Tuesday, Sept. 13, 2016. Francisco Kjolseth | The Salt Lake Tribune New Delta Air Lines CEO Ed Bastian talks about the future of Delta and its operations in Salt Lake City during an interview on Tuesday, Sept. 13, 2016. Francisco Kjolseth | The Salt Lake Tribune New Delta Air Lines CEO Ed Bastian talks about the future of Delta and its operations in Salt Lake City during an interview on Tuesday, Sept. 13, 2016. 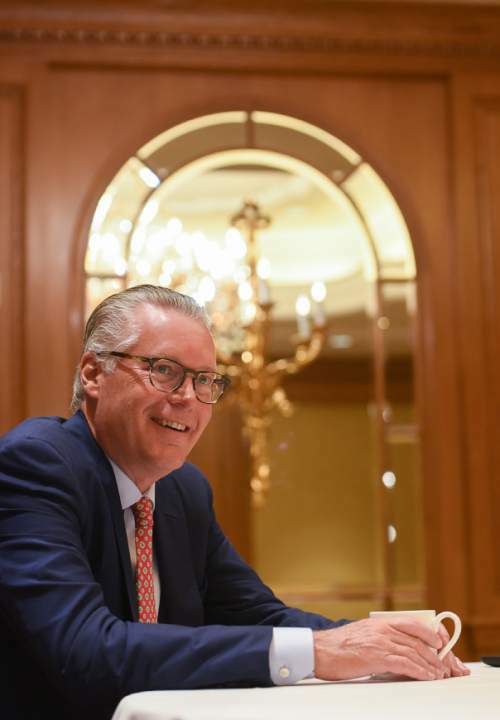 New Delta Air Lines CEO Ed Bastian said Tuesday that he envisions plenty of growth and innovations coming to its Salt Lake City hub. That could include adding more international destinations, especially in Latin America; more nonstop flights to more U.S. cities; larger aircraft continuing to replace smaller regional planes; and innovations to help speed security lines in Delta&apos;s terminal. He also sees its Salt Lake City operations  where Delta employs 6,000 people  as a key to the carrier&apos;s growth in the West, especially in the Mountain states. 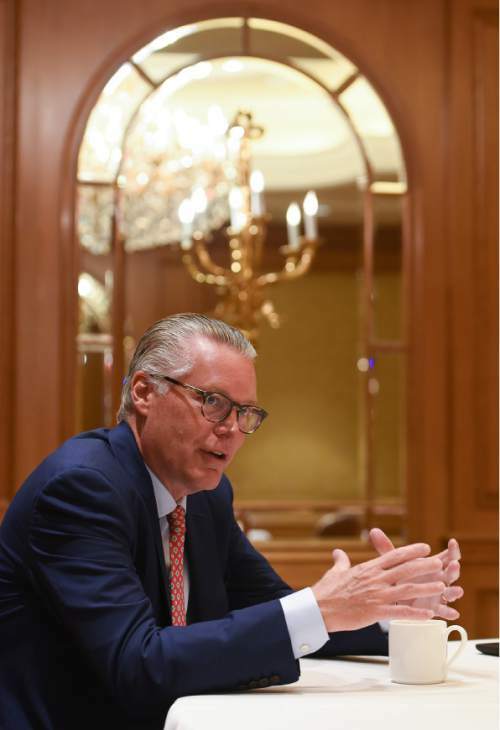 "West of the Mississippi is where we see the greatest growth opportunities in our business," Bastian said in an interview Tuesday, when he spent the day in Salt Lake City meeting with numerous employee groups and major Utah customers. "We&apos;ve grown 60 percent over the past five years" in number of seats sold on flights to and from Salt Lake City, he said. "That&apos;s a very large number. There&apos;s no reason to think we can&apos;t continue to grow and expand here." He adds, "It&apos;s a great destination market. And as we rebuild the airport here, there&apos;s going to be even more opportunities down the road" for enhanced operations. 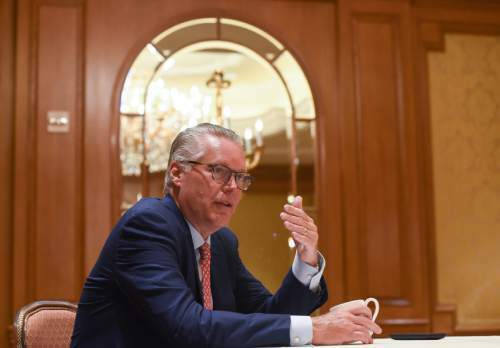 Bastian became CEO of Delta in May after 18 years with the company  including quitting once over dissatisfaction with the direction it was taking, only to be brought back later to help restructure it. He&apos;s no stranger to Salt Lake City. He owns a condo in Deer Valley. While he loves to ski there, he says he actually prefers coming during the summer to explore and enjoy the mountains. Bastian says he wants Utahns to view Delta as their hometown airline. "In 2015, we finished with almost 15 million passengers carried to and through Salt Lake," he said. "It&apos;s a very important market for us." He said recent efforts to build international partnerships may bring more international flights here. For example, he said Salt Lake City benefited from Delta buying a 49 percent interest in Virgin Atlantic. "We would not be flying today from Salt Lake City directly to Heathrow [in London] had it not been for that" and "the customers they brought us." Similarly, he said Delta is finalizing a deal to buy a 49 percent stake in Aeromexico. "That should close by the end of this year. We&apos;re going to create a joint venture, so I think you are going to see more traffic go through" Salt Lake City to Latin America. He said other partnerships could also help expand service to Mexico and Canada. Bastian said present service from Salt Lake City to Europe  in London, Amsterdam and Paris  could also expand over time, but probably not immediately. "We just launched London and Amsterdam within the last year, so we need to get those markets matured," he said. "The first year is always a build year. Depending on how those markets mature, there could be additional opportunities for expansion." He expects additional growth to domestic locations from Salt Lake City. "We&apos;re going to be launching [nonstop flights to] Miami in December. We just started Raleigh-Durham," and he adds he sees more opportunities coming. Bastian said Delta also has been replacing small regional planes with "mainstream" larger planes, and more of that will be seen with a new 110-seat plane to be introduced here soon  which he says should enhance customer experience. At Delta&apos;s main hub in Atlanta, the airline recently worked with the Transportation Security Administration to introduce some innovations to speed security lines  and Bastian expects them to land in Salt Lake City soon. Instead of single-file lines where people grab plastic tubs to put shoes and electronics for scanning, new table designs allow five people at a time to load items for scanning. "It will eliminate one of the bottlenecks and facilitate speed," Bastian said, adding it has worked well in Atlanta. He said when it will come to Delta&apos;s terminal in Salt Lake City depends on when the manufacturer is able to produce needed equipment. Delta has implemented other recent innovations to help cut costs or improve performance, including buying its own refinery near Pennsylvania to cut the cost of jet fuel (he says the refinery made $300 million last year), and putting e-chips on all luggage to better track it. The chips allow passengers to track on smartphone apps exactly where their luggage is. Readers also will stop conveyor belts to airplanes if luggage to another destination accidentally is being loaded. Bastian said he aims to help Delta employees realize they are the reason for its success far more than any innovations or tools. "In our business, all of the airlines have many of the same tools," he said. "The only competitive advantage that Delta has is its culture and its people." He said he once quit Delta in 2004 when he felt the airline forgot that. "It was a very different airline. It was not delivering the quality of product of service and reliability that we ought to and are capable of. It was in a vicious cycle of job loss and pay cuts, and morale was suffering and customer satisfaction was declining" as it essentially tried to become a low-cost carrier. He added, "We were letting the Southwests, the JetBlues and Airtrans define who we were rather than playing offense and have them compete with us. We were trying to dumb down our experience. I was certain that would not be a happy ending." So he left. Six months later, a new Delta CEO rehired him to help restructure the airline. "We can define the market on our terms rather than someone else doing it for us, and we can create a global opportunity for our people to expand to." He said the philosophy has worked, and helped Delta expand and make big profits again  including paying out $1.5 billion in profit sharing to employees last year, 15 percent of its profits. "This really is a people business," he said. "Where airlines historically have gotten into trouble is where they forget the people part of the equation."